Can you tell that I love ice cream?! We whipped out our ice cream maker last week and enjoyed making ice cream as a family (we’ve actually done it twice). And doesn’t homemade ice cream just scream SUMMER?! Here’s our newest recipe that I got from my mother-in-law. It is so creamy and good. We added home-grown raspberries in ours. So yummy! Scald milk until bubbles form around edge. Remove from heat. Add sugar and salt. Stir until dissolved. Stir in half and half, vanilla, and whipping cream. Cover and refrigerate 30 minutes. Freeze, as directed on your machine. My mother-in-law said you can play around with the porportions of the dairy ingredients. The total amount of liquid should be the same. For example, you could do 1/2 cup less of milk and 1/2 cup more of whipping cream, if you want yours creamier. Or, if you don’t have 4 cups of half and half, you could substitute the remaining amount with milk or whipping cream. Growing up, we always made cookies and cream. What is your favorite flavor of ice cream? I love homemade ice cream! 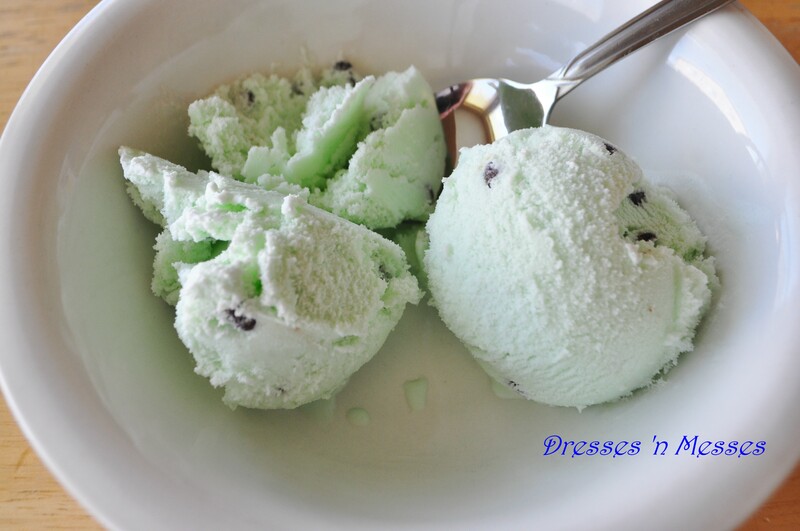 Our family’s favorite is mint chocolate chip!